boat full of modifications, but with almost an identical hull. As for its technical changes I’ using a 7.4v battery pack. I kept the same speed controller suggested by Petter and a different motor since I smoked the Cermag unit during initial trials due to the higher voltage. Fun while it lasted. I also got a commercially available brass drive shaft, a rudder and a propeller (3 blade 25mm M2 propeller; an 8” mini drive shaft). I had to cut the shaft a little bit, so next time I will order a shorter one. As a link between drive shaft and motor, I got a little rubber link from the same supplier since where I live some simple things like a tiny silicone tube can be difficult to find. Great thing was that I used the same nice Cermag motor mount for the new Mabuchi motor. As running time, you may run non-stop full speed ahead for about 10 min and the battery will still have power to go on. The problem is that at that pace you will fry the motor due to overheating. I know this because I kill one (yes, another motor!) like this. So I’m assuming you will have around 15-20 minutes, perhaps 25 minutes of fun if you treat your motor in a civilized manner. Other significant materials I used included marine lacquer, normal off-the-shelf spray car paint and Elmer’s-like waterproof wood glue. Knowing I would waste lots of wood due to my newbie status, I ordered double of what Petter recommended. I’m very glad I did. impossible to reach them from the inside. And then to the cabin. The plans called for a cardboard cabin, but after going this far I went wood. Since I did not knew how to attach the cabin to the hull in a decent way, I ended up improvising by adding 3 tiny screws and small pieces of plastic to keep it firmly in place and be able to open it at will while keeping it fairly covered from the elements. After all that work, the boat came up the way you see it. I ruined the paint job a couple of times, but after putting a couple of coats of car paint lacquer, it ended up looking somehow like fiberglass, which concealed most of the gaps I left during paneling. I only wish I could find little accessories like chairs, steering wheel, etc, to make it look nicer. I see myself improvising some in the future. It navigates very well. Petter did a terrific job with this design. Very stable and pretty rugged. What would I change? I would make it a little bigger to accommodate a bigger engine (yeah yeah! ), perhaps 3 more inches or so. I would also change the bow design to make it a little bit more modern (just my taste). One I think would look great is the one in the old 1970s Bertrams, especially the 46.6 Convertible (aka sports fisherman) or the 1970s Chris Craft Commanders. 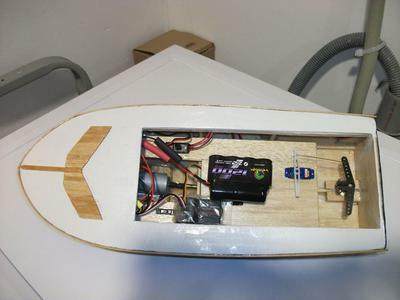 However, the current shape is pretty functional and capable when heading little waves with my engine arrangement. 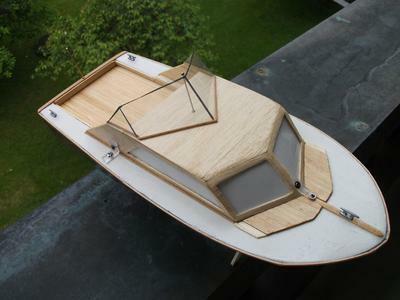 Petter, here is a suggestion: Take this great platform, make it a little bit larger (perhaps up to 20 inches) design a sports fisherman with it like the 70s Bertram, Chris Craft or Hatteras, and I assure you many people will request you plans right away. I’ll be the first one in line. Thank you for bringing realistic hope to R/C modeling super-green newbies like me! Can you specify what kind and shape of the plastic you used to keep the cabin down (Making my own boat)? Thank You! The build is excellent and have started constructing my own. The hull is almost ready. Deciding whether to glass/epoxy it or to use lacquer and tissue paper. I have started a build of my own boat. I have finished the woodwork and now need to laquer it. I am buildig this boat exactly to the plan. For my next build I intend to redraw the plan with 1 inch added between bulkheads 2 & 3 plus another inch added between bulkheads 3 & 4. This will increase the length to 17 inches. When i read your article, it felt as if you wrote it on my behalf. I am nearly finished with the hull, and than the cabin. Petter is very helpful and sent me some photos, which where very helpful. I will post some photos as soon as it looks like a boat..
Sure, you may find the boat in action at https://www.youtube.com/watch?v=Icb9yU-YuXc&feature=youtu.be You will also see a link below your message. I'm currently working in another pretty interesting project. I bought a Dumas kit of a Coast Guard 41' utility boat ($50) measuring 15 inches to learn from its assembly technology. The instructions are terrible and I'm not happy with the type of wood it brought, but with Peter's ideas and the experience with the Bon Vivant, I used the instructions only for the hull and then to protect my desk from the mess of the glue and painting (LOL). I got a picture of a beautiful boat (a 40'footer San Juan flybridge cruiser) and surprisingly, the hull is very similar. Then I used it as inspiration for the cockpit, which turned out pretty nice. I'm about to finish its planking, so once it is painted I'll post as well. I will use the very same power system as with the Bon Vivant, but I suspect it will go faster due to its design. However, I already see that the Bon Vivant will do much better in choppy water due to its draft. More to follow! B. Could you show us any video of Bon Vivant. I bought this rudder from a commercial source. 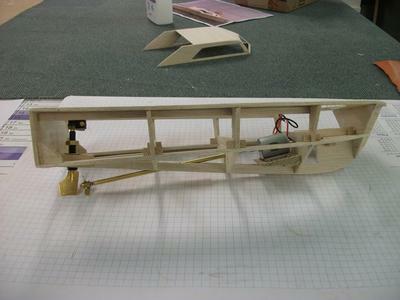 It was supposed to be a "micro" rudder, but it turned out quite big to me. I wanted to keep it as close to a real boat as possible. So I cut the thing and there you see the result. It works perfectly well no matter which speed it goes. Thank you for your kind words on my first project! I just did some real world tests on this boat. Amazingly, I was able to run the thing in a hotel pool for about 1 hour and 10 minutes while changing speeds and just cruising for fun. The battery/motor combo worked just better than expected. I also took it to a lake with a little of choppy water and it really ran well with very water drops on the rear deck. In the mechanical side, next time I will try to find a suitable coupling (I imagine those may exist in that size) since the rubber one I use tends to wear relatively easy with the power output I'm using (7.4v). For the moment, I put some Krazy Glue on each side of the rubber coupling and it does the trick (for the moment). As for the cabin, everything was done the old fashioned way, just by drawing the thing from an old picture and making the templates out of the drawing. I'm kind of computer illiterate! The front and top windshields were pretty challenging due to the angles, but at the end a little bit of patience paid off. Next thing are lights. I'm checking for some 3mm tiny ones. Let's see how it works out. For this is a result of great hardwork and interest. 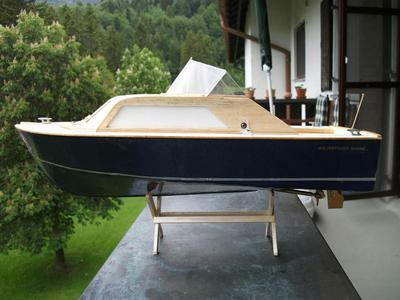 This is the most amazing RC model boat I've seen. The cabin is so sharp and perfect. Is this design made by CAD? I'm so impressed by the internal arrangement. A very good modification i must say! The thing that has really surprised me is the rudder size, well the rudder which I fit was 5 times larger than this hah...though i was very well able to maneuver but does this small size has a bigger advantage in taking turns?? That's an awesome boat! ...and what a write-up! In all honesty, I think you did a much better job with the cabin than the original. I'm also contemplating your suggestion of a bigger version...I think it's a great idea. The motor upgrade sounds very interesting and definitely a boost in performance. It also sounds like the new motor could benefit from a cooling jacket. You can make your own out of thin copper tubing. It may even be a subject for a future web page. You made a comment about that there are no planking templates on the plans. I actually had some, but intentionally left them out of the plan. The problem with such templates is that they are not at all forgiving. If your hull structure is slightly off (which is all too easy to do), the planking won't fit. My solution was to use the method illustrated in my build, where smaller panels are added piece-meal, and edges are trimmed once each panel is covered. In any event, the comment is valuable and I may include planking templates in the future. All in all, a great build, and it sounds like you had a lot of fun - the most important part!